I am delighted to publish another guest post from Jan-Erik Nilsen who has been systematically exploring the mountains around Beijing this summer…. Here is a report of his visit to Lingshan, west of Beijing City. Trip report from Lingshan mountain, Saturday, July 14th. Lingshan is located west of the capital and, reaching a height of 2303 m, it is the highest peak in the larger Beijing area. Driver Mr Lu picked me up at 6.30 and, via Starbucks at Guo Mao for coffee, we went towards the west, first along the 3rd ring road, then along the G109 road. The road follows a river through a valley and gives some nice mountain views, especially the last part before reaching Lingshan. The villages along the road looked comparatively prosperous, every fence and house was recently painted, the bricks in the walls in perfect order. Quite different from along a similar river valley road to Baihua Shan, just some 20 km to the south where I went the weekend before, where the villages looked rather poor. 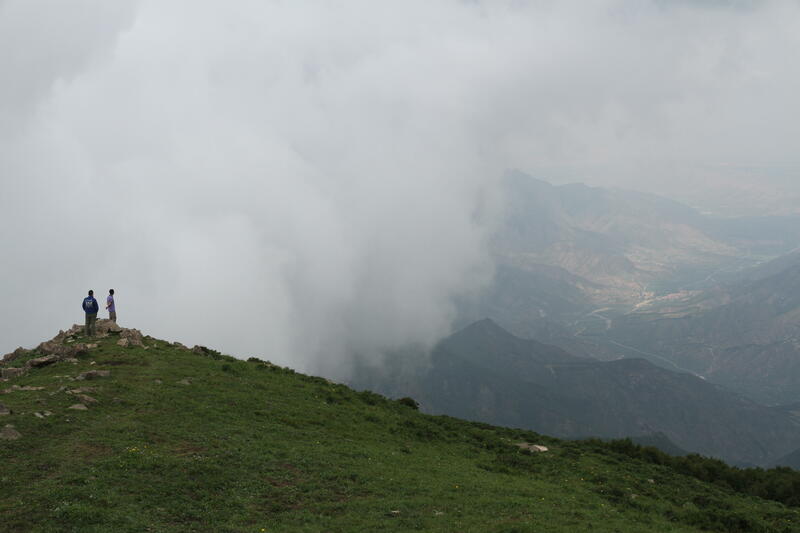 At 10.30 we reached the parking at the end of the road, at an altitude of 1500 m, on the eastern side of Lingshan. A Claudia’s Leaf Warbler sang in a strange way at the parking, kept me busy until it uttered more familiar calls. 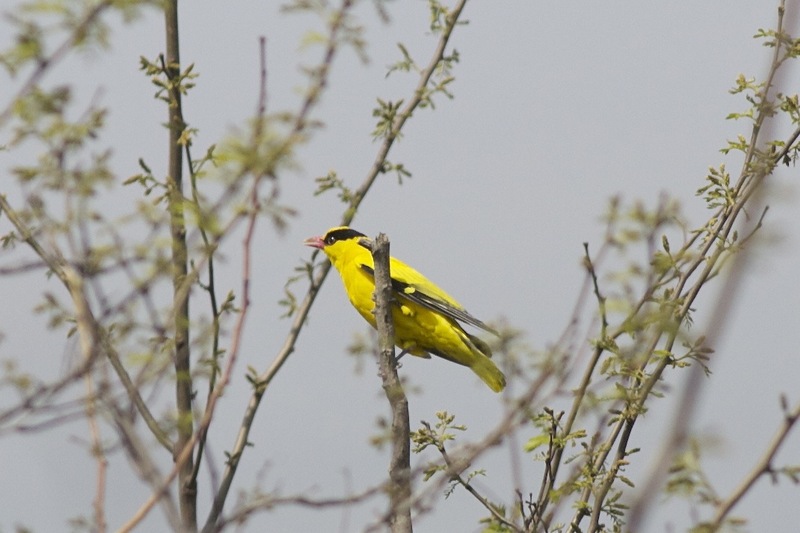 A Yellow-streaked Warbler sang, a male Chinese Beautiful Rosefinch, and a male Russet Sparrow jumped among the cars and contributed to a good birding start. There are two options to get to the top. A 3-hour hike, or a 20-minute ride by cable car to 1900m followed by only a 1-hour hike. Loudspeakers on the cable car were screaming Chinese heavy metal music – this Chinese band could rather have left this particular music genre to the British and American bands who know how it should be done. The hiking track ran just beside the cable car, so the choice actually became 20 minutes of Chinese heavy metal or 2 hours. A simple choice – cable car of course. The slope is covered by birch trees, except a wide alpine meadow with flowers and butterflies under the cable cars and on both sides of the hiking track. From 1900m to the peak, it is mostly rocky alpine meadows, and a few patches of birch trees. 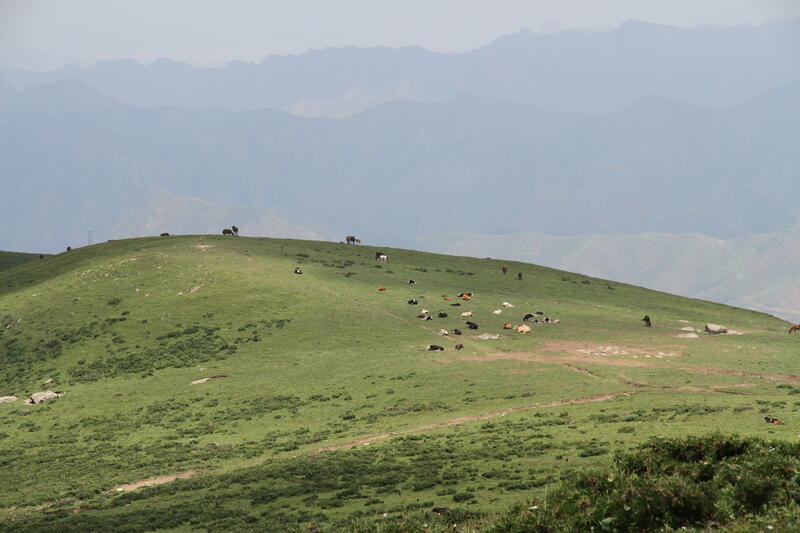 Cattle, horses and yaks keep the grass short and other vegetation low. I hiked towards the peak, which had so far been obscured by clouds, but after a while the sun broke through and the peak was revealed. I spent more than an hour up there, and enjoyed spectacular mountain views. New clouds passed all the time, some touched the peak and it became very foggy during shorter intervals, else min. 20 km visibility. It’s cooler in the mountains than in the city, a main reason why this Scandinavian enjoys doing mountain trips during the 35C hot Beijing summer. On the way down, a group of yaks had approached the track and a group of 20 Chinese tourists took pictures of them. So did I, and in my search for the perfect angle I happened to come close to the leader bull. 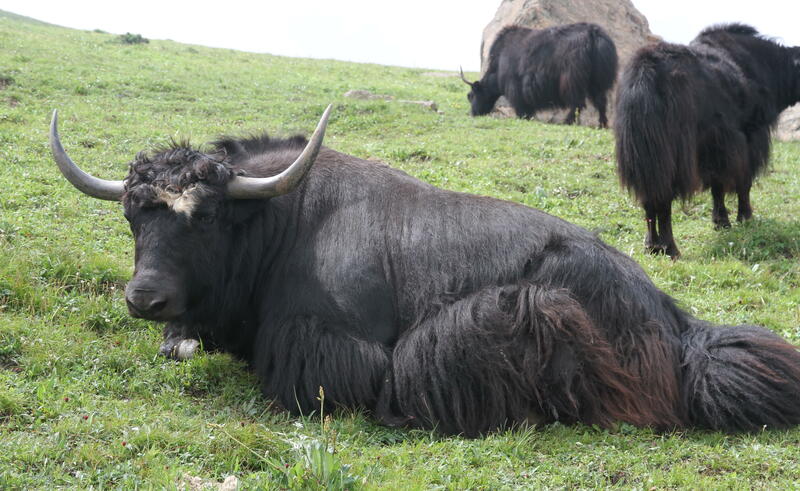 So far it had been lazy resting on the ground, with all other yaks feeding around it. The bull stood up and began to walk firmly towards me. I ran away and it stopped after a few meters, but it continued to stare at me. The 20 tourists may have been more scared than I was, but I don’t recommend anyone to assume a 1000 kg yak bull will be a particularly friendly animal, however cosy they may look. I saw some passerines that briefly jumped up to a big rock 200 m up on the mountain, so I went up there to check them. A group of 5 Beautiful Rosefinches. The strange thing was that the group of yaks continued to stare at me when I went up there, and even though there was a group of people much closer to them. It seems I had been labelled of ‘bad standing’ among the yaks on Lingshan. The mountain tracks were crowded, lots of tourists, some of them bringing their dogs, some people supplying horse rides for the tourists, a few vendors along the track, and at the peak they regularly fired off firecrackers. Despite that, some nice birds were seen. Rosy Pipits on the way, and a pair of Rosys close to the peak carried food in their bills, proving they are breeding here. A Red-billed Chough called. I counted 8 singing Chinese Leaf Warblers along the way and the total count of Chinese Beautiful Rosefinches was 12. How could you not fall in love with a bird with such a beautiful name? Back at the parking again, I found more Russet Sparrows. The total count became 5, one carrying food in its bill so they must be breeding there, too. It’s too far north, outside their area according to the books, but it’s not the first time Chinese birds have different ideas of their breeding area than what the books teaches. Ref. 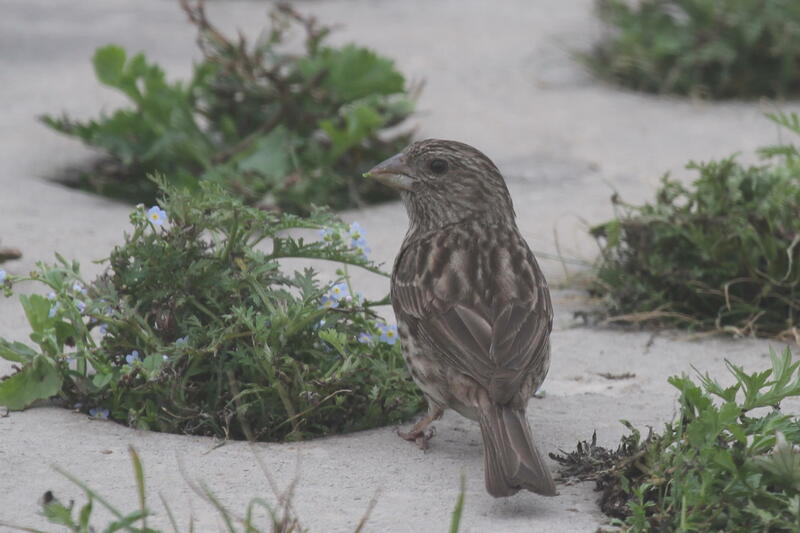 Spike Millington, he has observations of Russet Sparrow from Baihuashan and Lingshan and Jesper Hornskov in an e-mail says it is fairly common north of Huairou, so it seems it is not very remarkable in the Beijing mountain areas anymore. McKinnon writes it ‘lives in flocks in upland open forest, woodland or scrub near cultivation, and in the absence of House Sparrow it becomes a bird of towns and villages’. 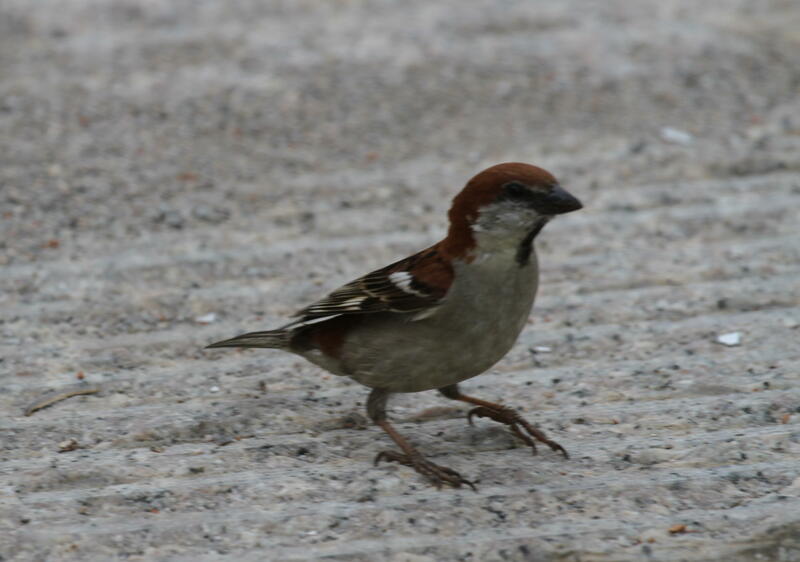 For the Beijing area Tree Sparrows could replace House Sparrow in this statement. Tree Sparrows are normally just about everywhere where there is a house or a human, but I saw none of them up here, giving the space to Russet Sparrows. On the way home, east of Lingshan, we stopped to take pictures on some dramatic slopes, and saw three Red-billed Choughs. Let me try a not very scientific assessment of the four mountain areas, all in the larger Beijing area, I have visited in June and July this year; from SW to NE Baihuashan, Lingshan, Haitoushan and Wulingshan. Wulingshan and Haitoushan have deeper, more diverse and lush mountain forests and larger areas of coniferous forests, which will likely provide more species. Wulingshan is the best for birding, but based just on what the forests look like, I think Haitoushan is in the competition, and could deserve more attention. Baihuashan and Lingshan have more birch forests, and they have alpine meadows of a kind not found on the other two – especially Lingshan which has vast alpine meadows. Wulingshan and Haitoushan have forests in a character of their own. They are more virgin and deep enough to bring a certain mysterious feeling. A kind of feeling difficult to describe but I think many who have wandered into a deep forest in Scandinavia is familiar with it. Even if you are alone, deep into the forest, it feels like someone is watching you. Entities from ancient myths will soon not seem so unlikely anymore. You begin to feel uncomfortable. You get lost. You cannot find the way. When you finally come out of the forest you are far from where you thought you would be. Some people, me not included, are scared of walking alone into such forests. 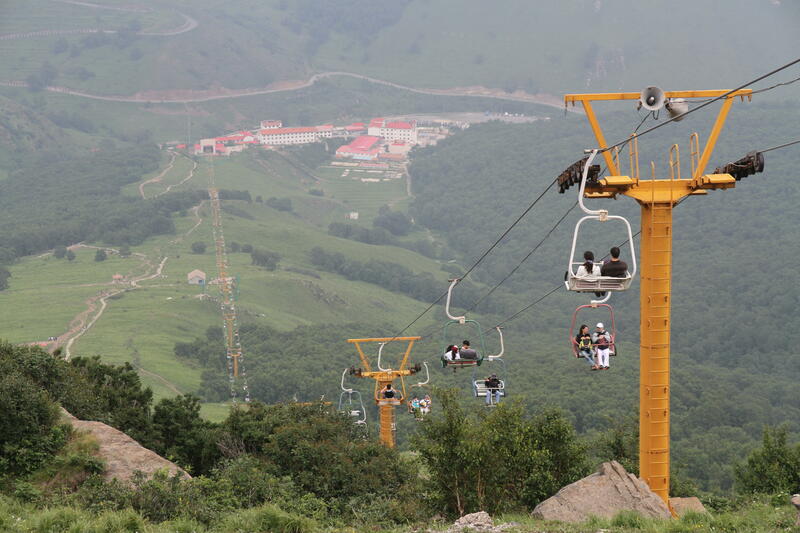 No one should hesitate to go to Lingshan because of the many tourists or the heavy metal loudspeakers. The alpine meadows are vast and very nice, peaceful areas can be found just a hundred metres off the track. 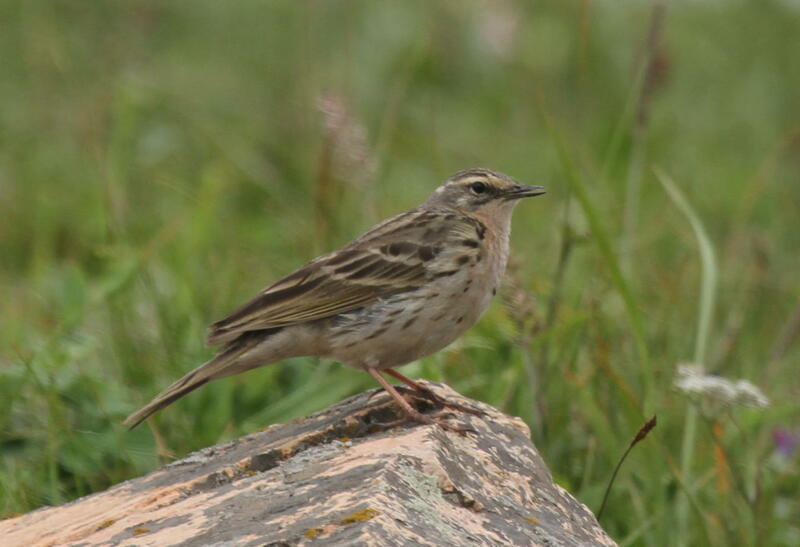 The meadows bring more Chinese Beautiful Rosefinches and Rosy Pipits than elsewhere, they can hardly be missed at Lingshan. The road to get there has some spectacularly nice views, and on the way you can have a look at Cuandixia, a village of over 70 Ming and Qing dynasty courtyard houses. I would certainly have stopped there if I hadn’t run out of time. And if you go – don’t forget the sun-block! Today was tough going. The wind got up almost immediately after dawn (after a still night) and just kept on increasing in strength. By mid-morning there were white tips to the waves offshore and I estimated that the wind speed was around 25mph SSE. After our third taxi driver picked us up from the hotel at 0430 (the first two did it once and said never again!) and dropped us at the lighthouse, we immediately made our way to the ridge for visible migration. There were a few hirundines to keep us interested early on and, around 0645, a small flock of 5 Chinese Grosbeaks (yes, they were Chinese – we checked!) flew around the point before settling near the lighthouse. Jesper Hornskov and his clients for the Qinghai trip arrived yesterday for a couple of days ‘pre-tour’ visit of Laotieshan but today they were going up the coast for the Black-faced Spoonbills and waders (similar to our trip on Saturday). They were leaving at 0715 and we had spaces on the bus if we wanted to go. At 0700, with it looking like a quiet day, Spike decided to go with Jesper but I decided to stay at Laotieshan. As I write this, I don’t know how they got on up the coast but, for me, today was hard work… Very little visible migration and, with the wind so strong, it was difficult to find passerines in the swaying branches… Nevertheless, again I saw some good birds. Highlight was a probable Claudia’s Leaf Warbler (similar to Eastern Crowned but smaller and lacking the yellow wash to the vent). 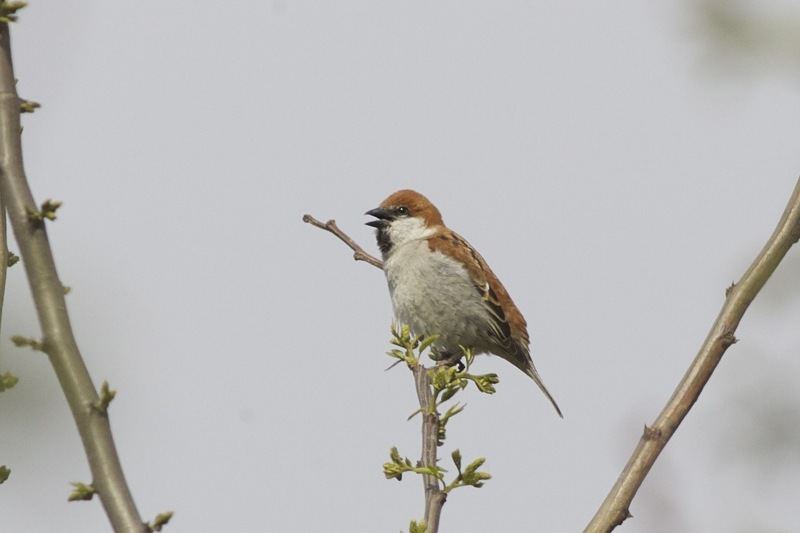 Also, I refound the (or found a new) male Russet Sparrow as he sang from a treetop near the lighthouse. Four Daurian Starlings were new for the trip and singles of Chinese Egret, Oriental Honey Buzzard and a day-calling Oriental Scops Owl ensured there was interest throughout the day. We really need some rain to mix things up a bit.. Although there is clearly turnover each day, the volume of birds has been decreasing daily since we arrived, almost certainly due to the clear weather and southerly winds. The forecast for tomorrow is for some showers, so maybe that’s just what we need.. Only two more days to go so fingers crossed for the ‘big one’…!